Hello and Happy Tuesday again! I had a wonderful weekend and have survived Monday again so all is good, right?? 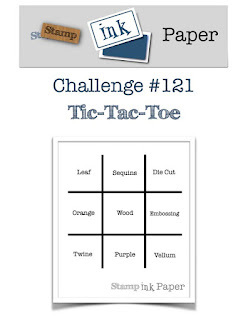 lol As usual Tuesday means another Stamp, Ink, Paper Challenge and this time is another Tic-Tac-Toe with lots of options! I decided to pull out my favorite fall stamp set by Stampin' Up! Vintage Leaves and the Leaflet Framelits. I also revisited a fun technique called Joseph Coat. I started out by sponging Daffodil Delight, Crushed Curry, Pumpkin Pie, and Wild Wasabi onto Bristol Smooth Cardstock. 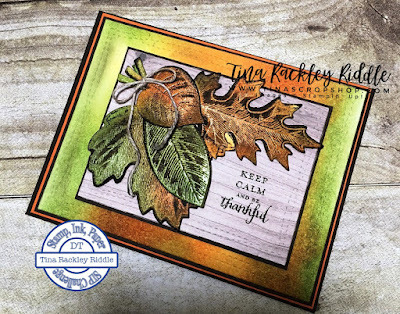 I stamped the leaves onto the ink blended cardstock with Versamark and then clear embossed them. Once embossed I used a brayer to bray Early Espresso Ink over the embossed leaves. Once the ink dried, I used the coordinating Leaflet Framelits Dies to cut the leaves out. I did the same type of ink blending onto another Bristol Smooth Cardstock for the background on this card. The ink blended layer was cut into a panel with Avery Elle Wonky Stitches Dies. I double matted it with Early Espresso Cardstock and then Pumpkin Pie Cardstock and then attached it to an Early Espresso A2 Card Base. I used the smaller rectangle from the Avery Elle Wonky set to cut out a piece of the Wood Textures DSP. I matted it with Early Espresso and then added it to the center of the card. I stamped the sentiment (from the September Paper Pumpkin kit) using my Misti in Versamark first and then Early Espresso Ink and then clear embossed it. The leaves were arranged in a bundle of sorts and then used Natural Twine to tie a bow in it. The leaves were attached with dimensionals. The smaller ones were adhered to the front with Tombow liquid adhesive.